Nearly three million people work as registered nurses in the United States, and experts expect that number to grow by 15% through 2026. Despite the faster-than-average growth rate, finding employment as a nurse will still be challenging. With the increase in jobs comes an increase in people who graduate from nursing programs. You'll need to stand out from a sea of other applicants, which means you need to make an excellent impression right away. The best way to do so is by creating a professional, well-written resume. Our high-quality RN resume templates can help. Use them to guide you through everything from including the correct information to formatting your fonts and spacing. 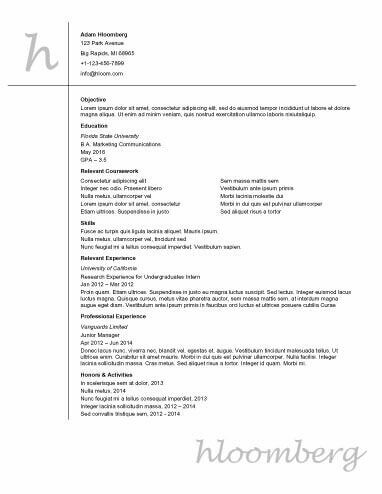 Why Use RN Resume Templates? Are you applying to a modern healthcare practice or hospital? Perhaps you intend to work in a pediatrics office. Some cases call for more contemporary templates. Use them to add pops of color, interesting head fonts, or other types of unique design elements to your resume. The non-traditional format will likely draw the recruiter’s eye and, hopefully, keep him or her reading. There’s nothing wrong with using basic RN resume templates, either. Basic templates allow your experience and education to speak for themselves. Additionally, a traditional template may be easier to create and easier for a recruiter to read. They are also printer-friendly, which is essential if you are attending hiring events or need to take a copy of your resume to an interview with you. Nurses who just graduated and have yet to gain professional experience aren’t likely to benefit from the traditional chronological resume. Graduate RN resume templates use a more functional format that focuses on education instead of experience. Use one of these templates to feature relevant academic rewards, clubs you were a part of, or internships you completed. Some people feel it’s best just to stick to the basics. Do you want a template that you know will be effective? These tried and true templates are some of the most popular ones we offer. Whether you choose one that is chronological or one with a more contemporary design, rest assured that these templates performed well for previous users. Jobseekers who are just starting out or who intend to seek employment in a more conservative environment may want to use the traditional one page RN resume templates. These templates typically use chronological order and stick to a common black and white motif. In addition, because each template is only one page, it is more likely that a recruiter will find the most important information more quickly. Our RN resume templates provide excellent designs and proper formatting, but these two factors alone aren’t enough to entice recruiters into calling you. It is essential that you provide a comprehensive overview of your skills, education, and experience to gain attention and receive calls to an interview. As you write your resume, remember the following guidelines. In addition to RN resume templates, a resume builder may also be useful. Our resume builder guides you through each step of creation, providing tips for which information to include and how to format it throughout the process. Guidance isn’t the only benefit, though.